For the final expansion for the Year of the Raven, Hearthstone gets ready to rumble with King Rastakhan. The BlizzCon Opening Ceremonies continued on Friday morning with the reveal of the latest Hearthstone expansion. 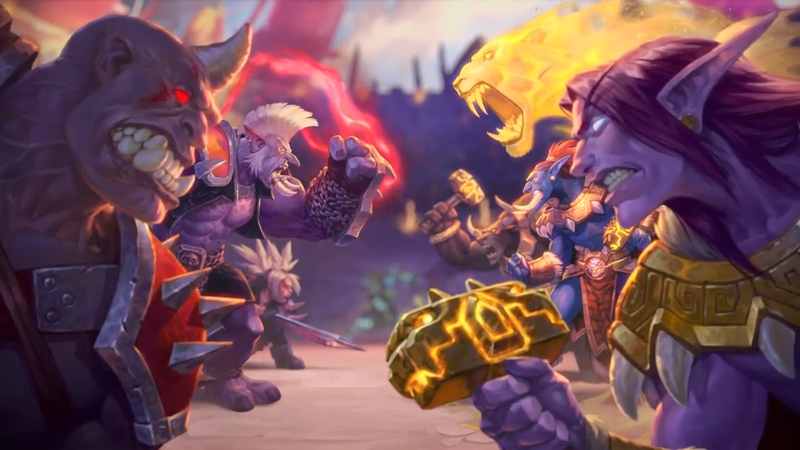 The final expansion for 2018 takes players into a different kind of battle for the favor of King Rastakhan. The newest Hearthstone expansion is Rastakhan's Rumble. Rastakhan's Rumble will see a new keyword called Overkill and some wild new cards. Each class will also get a new Spirit minion, which will grant some class-related boosts. All of them will get Stealth for its opening turn and have 0/3 stats. But that's just the beginning, as each class will trot out a powerful Loa Legendary minion. Think of the Loas as the team mascots. All nine of those Legendaries will have their own crazy effect, each to help build around a certain deck type. Rastakhan's Rumble is set to release on December 4. I really hope the new priest buff spell isn’t the next keleseth. Also the only thing extra for the $50 preorder is cosmetic so I guess I’m buying the $20 one.